Did you know you can make your own essential thieves oil recipe? A true blue homesteader should, because every homesteader I know practically swears by the many benefits of thieves oil. It’s also interesting to know thieves oil history. Legend tells of four thieves during the Black Death plague in the Middle Ages, who robbed the dead yet reportedly never contracted the disease. When finally caught, they revealed how they avoided the plague by rubbing their bodies with an essential oil mixture, which we now know as thieves oil. True or not, it can’t be denied the power and popularity of this essential oil has endured for centuries. Ready to start cleansing and healing with thieves oil? 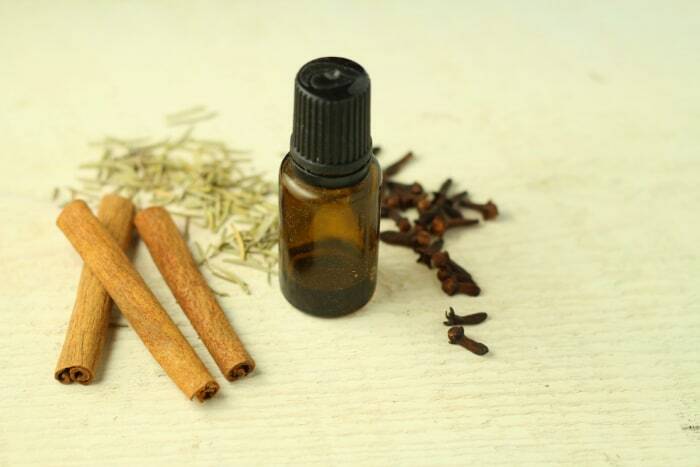 Here’s a thieves essential oil recipe you can make at home! Prepare the ingredients along with clean, sterilized bottles and droppers. Use a dark glass bottle for storing your finished product. A 15 ml dark bottle is just the thing you need for this recipe. Combine all the essential oils and store in a dark glass container. Keep away from sunlight and store it in a cool, dark, and dry place. Remember, a little essential oil goes a long way. You can make DIY cleaning products and aromatherapeutic home remedies with this recipe. Mix 1 drop thieves oil with 4 drops carrier oil. Apply topically to feet, neck and behind the ears. You can also mix this into your homemade cleaning products to amp up their disinfecting power. This essential thieves oil is not only useful when you’re looking for a great way to freshen up the air in your home, but many people administer it for other practical purposes. You can even use it to remove the gunk that labels and stickers leave behind. This thieves oil recipe is easy and adaptable in case you prefer not to include as much of one essential oil or prefer to add more of another. Enjoy! How did your homemade essential thieves oil making go? How have you been using it? We’d love to hear from you! Tell us in the comments section below! Editor’s Note: This post was originally published on April 7, 2017, and has been updated for quality and relevancy.